To learn more about each Ansul fire suppression system, keep reading—or call us today at 866-308-5701 to discuss which is best for your property and request an estimate. A proud Ansul Double Diamond Alliance Partner, State Systems specializes in the installation of Ansul fire suppression systems that work as clean agent fire suppression mechanisms to protect your Mid-South property and all that is inside. The Diamond Alliance recognizes Ansul system distributors for outstanding performance in the sale of special-hazards fire protection equipment. Less than 20 percent of Ansul distributors have Diamond Alliance Partner distinction. Ansul itself is a premium brand of Tyco Fire Suppression & Building Products. 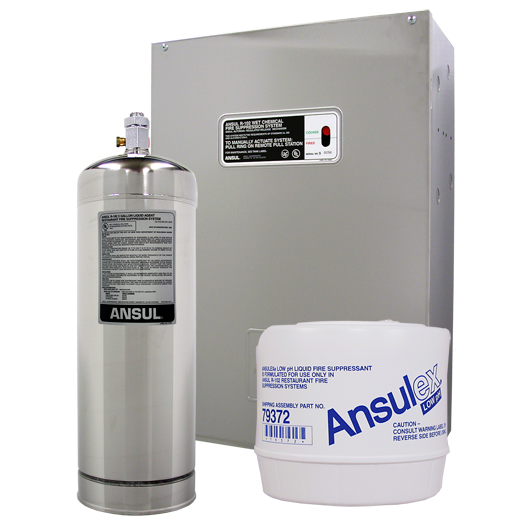 The Ansul SAPPHIRE Novec 1230 is a highly effective system that serves as a powerful clean agent fire suppression method. Instead of using water to extinguish a fire, this clean agent system is custom-engineered to suppress fires safely, rapidly and efficiently while still protecting your expensive electronic equipment. The heart of this Ansul system is the revolutionary 3M SAPPHIRE Novec 1230 fire protection fluid—a clear, colorless, and odorless clean agent. By instantly vaporizing upon discharge, the clean agent used can complete flood protected areas to suffocate the fire and absorb heat. This sophisticated Ansul system suppresses a fire before it can start by detecting it at invisible levels. It also quickly evaporates after the danger has passed, ensuring your valuable assets aren’t harmed. An electronically non-conducive medium is required. Electronic systems cannot be shut down in the case of an emergency. Large groups of people gather, making it essential that a non-toxic agent is used. 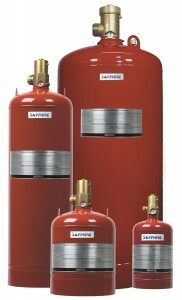 In accordance with NFPA 2001, the SAPPHIRE Novec 1230 is safe for use in occupied spaces. Additionally, with an ozone depletion potential (ODP) of zero and a global warming potential (GWP) of one, this Ansul system is among the most environmentally friendly clean agent fire suppression systems available on the market today. The Ansul INERGEN is another very effective fire suppression system that protects enclosed areas where there is a high need for quickly reacting to and suppressing a fire. Fire protection technicians choose this system when there are typically large groups of people present in the area and traditional suppression agents are not safe for use. Leaving behind no residue and with an ODP and GWP of zero, the Ansul INERGEN is the most environmentally friendly fire suppression system on the market. Unlike halocarbon alternatives, which create dangerous levels of hydrogen fluoride in the presence of fires, this Ansul system is completely nontoxic. Additionally, it does not produce any fog when in operation, leaving escape routes visible. The advanced Ansul INERGEN can detect a fire even before it reaches the flame stage. The Ansul R-102 Liquid Agent System is the best protector and defender of today’s kitchen equipment and commercial restaurants, and you can choose from two design options. The first is the appliance-specific design. With the appliance-specific design, the most efficient fire protection is accomplished when nozzles are selected and aimed at specific hazard areas on each appliance—especially where grease and flames might meet. This method usually offers the most economical use of liquid agent, reducing the size or quantity of storage tanks and associated hardware. The second design option is the overlapping appliance protection. When flexibility and simplicity are the main priorities for restaurant managers, nozzles are placed in a straight-line arrangement, providing overlapping agent discharge patterns. This forms a virtual fire-free zone where appliances of various types and sizes are protected, even if they are replaced or rearranged under the hood. 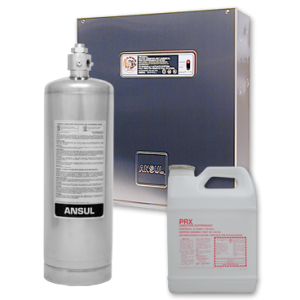 Call us at 866-308-5701 to learn more about Ansul R102 Restaurant fire suppression systems. This system is suitable for use in restaurants, hospitals, nursing homes, hotels, schools, airports, and other similar facilities. When actuated, the system discharges a fixed amount of proprietary wet chemical agent followed by water through the same nozzles (provided by a connection to the portable water supply). Contact State Systems to learn more about the Ansul PIRANHA restaurant fire suppression system. Whatever the application, from cylinder to nozzle, each system is custom-designed for the specific fire hazards in your Mid-South building or facility. State Systems is also proud to carry Ansul Vehicle Fire Suppression Systems. These systems were invented and introduced in the 1960s in order to protect commercial vehicles and moving equipment. As mobile equipment has grown in size and complexity since then, so have these vehicle fire suppression systems. When put together, all of these components can ignite the flammable liquids and debris. Owners of vehicles equipped with an Ansul Fire Suppression System have taken an important step in facing the fire problem. Call us or contact us online to learn more or request an estimate for your commercial fleet. To learn more about the Ansul systems we can install for your Mid-South business, or for an estimate, contact us online or call 866-308-5701. We will help determine which Ansul system is most appropriate for your business and your needs in order to best protect your property, life, and assets.